A market place will be turned into a foodbank collection point next month (Friday, July 10). The Unite Community will be holding a donation event for County Durham Foodbank and the County Durham Socialist Clothing Bank in Durham Market Place on Friday, July 10 – the day before Durham Miners’ Gala. The move was inspired by an event in Glasgow following last year’s Scottish independence referendum, staged to highlight the impact of austerity cuts. A Unite Community spokesman said: “On the Saturday, over 100,000 people will take part in Durham Miners’ Gala in a huge demonstration of solidarity. The collection will run from 10am to 3pm. Union chiefs Len McCluskey and Matt Wrack and left-wing author Owen Jones will top the bill at this year’s Durham Miners’ Gala. 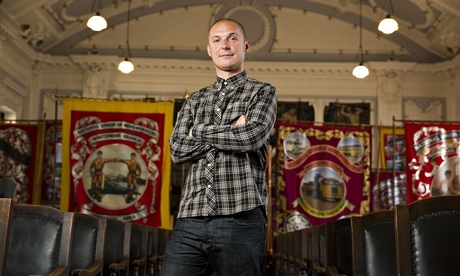 The general secretaries of Unite and the Fire Brigades’ Union (FBU) will be joined by the firebrand Guardian columnist on the Durham Racecourse speakers’ stage at Europe’s biggest trade union event on Sunday, July 11. Durham Miners’ Association secretary Dave Hopper will also introduce Steve Murphy from UCATT, John McDonald from ASLEF and Chris Keates from the NASUWT. However, Ed Miliband will be absent – organisers having decided not to invite the Labour leader. Mr Miliband, who claimed the Labour leadership ahead of his brother David with strong union backing, became the first party boss to address the Gala since Neil Kinnock when he travelled to Durham in 2012, but has not returned since. Tens of thousands of people are expected to turn out for the 131st Gala, as dozens of brass and bagpipe bands march union and colliery banners through Durham City’s historic streets past dignitaries watching from the first floor balcony of the Royal County Hotel and to the Racecourse where, in addition to the political speeches which start at about 1pm, there will be family entertainment, campaign stalls and more. The traditional blessing of the banners service will take place in Durham Cathedral. Mr Hopper said he was very pleased with the speakers line-up. The outcome of this week’s General Election is bound to be the central theme of the speeches; and Mr Hopper said he could not see Labour winning. “The Scottish girl (Scottish National Party leader Nicola Sturgeon) has run rings around them. “Miliband hasn’t come across very well. She’s putting him on the spot every time,” he said. Last year’s Gala had a mournful feel, as guests paid tribute to the late Labour grandee Tony Benn and union leader Bob Crow. On Gala day, the centre of Durham will be closed to traffic from 7am. Visitors are encouraged to use park and ride buses. > Interesting developments ? Are the decision not to invite Miliband, and Dave Hopper’s comments about Labour’s chances the beginnings of a move away from the Labour Party ? Labour figure Hilary Benn has told of fond childhood memories attending Durham Miners’ Gala, but admitted a Labour Government could not offer money for the under-threat event. The Shadow Communities and Local Government Secretary, whose much-admired father Tony Benn was a fierce defender of the miners during Margaret Thatcher’s time in power, recalled the magic of the Big Meeting when he watched banners pass the County Hotel balcony. But he said his party, which was founded by the union movement, could not offer cash to back the Big Meeting. The event was founded by the Durham Miners’ Association and has a long and rich history as a celebration of the region’s heritage. Tory Communities Secretary Eric Pickles seized on the chance to criticise Labour and accused them of failing to “respect their roots”. 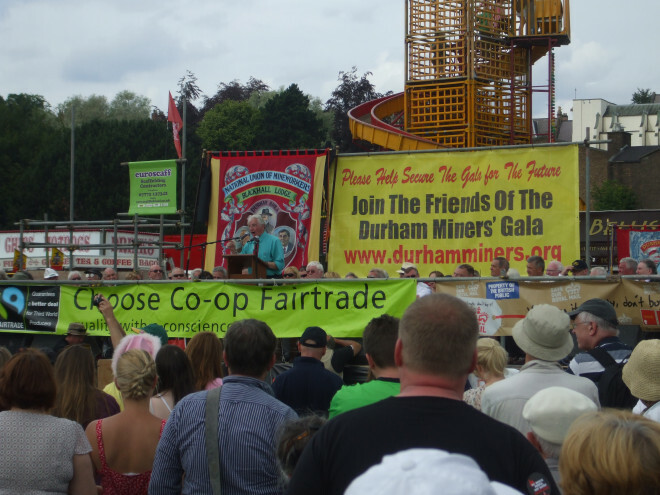 The Gala’s future is uncertain as the association is struggling to find fresh funds, organiser, general secretary of the Durham Miners’ Association Dave Hopper told the crowd in 2014, though it will go ahead on Saturday July 11. Hilary Benn, who followed his father into a career in Parliament and is campaigning to be re-elected in Leeds Central, said he shared Mr Hopper’s fears for the event. “One of my earliest childhood memories was my dad taking me up to the Gala,” he said. “There must have been about 11 of us on the famous balcony of the County Hotel, including Harold Wilson. But it is a sure signal of just how tough times are that the Labour Party can’t offer any money towards the event. The Miners’ Gala was first held in the city’s Wharton Park in 1871. Numbers grew strongly during the miners’ strikes to attract huge crowds of as many as 300,000. Though the North East mining industry is a shadow of its former self, the Big Meeting continues to pull thousands of visitors. Lodge banners are marched through the city and hundreds gather at a field near banks of the River Wear in what is a proud celebration of the North East’s heritage. Tony Benn was one of the great figures of the left that have spoken at the event. Labour Leader Ed Miliband has told colleagues he will give a speech this year, sharing a stage with long-serving parliamentarian Dennis Skinner. The association said it was left with a £2.2m legal bill after losing a six-year court battle on behalf of former miners who have osteoarthritis of the knee. Critics, including Labour’s North Durham candidate Kevan Jones, however, say the association had £6m in its accounts when it was a union in 2007. Mr Pickles said a Conservative Government would not offer any help but insisted the party’s plan to create jobs would see more people support the event. Mr Benn said one of the things the unions, many of which will be represented at the Gala, will fight is the rise in zero-hours contracts which grew four-fold under the Coalition government. Mr Pickles, however, said: “As it is predominantly Labour Party and trade union members involved you would expect them to respect their roots. The president of a transport union with roots in the Labour Party will contest a North seat for the Greens. The union boss also brands Labour “a sort of reddish Conservative Party” and accuses MPs of betraying working people. The dramatic political move by the ex-TUC General Council member threatens to derail Labour’s campaign in one of its top target seats. The RMT boss also revealed the union has donated £7,000 to Caroline Lucas, the country’s only Green MP, after the Greens were supportive of plans to renationalise the railways. “Labour is no longer the working class party. They have betrayed us time and time again. They should remember that it was the unions who formed the ‘party of labour’ not deny our links. “The radical Labour Party of 1945 is long gone. No longer do they champion nationalisation, social housing, the NHS, education etc, they are a sort of reddish Conservative Party. Labour hit back last night, saying a vote for the Green Party is a vote for the Tories. > This is the kind of stupid comment that makes me even less likely to vote Labour. It’d obviously be a vote against Labour, Tories and Lib Dems… because we have no belief in any of them anymore. The move underlines a deepening fracture in the relationship between Labour and the RMT. Predecessors to the RMT were among the unions which founded Labour back in 1899. But after 105 years of history the RMT was disaffiliated by Labour in 2004, after the union rejected an ultimatum to stop supporting the Scottish Socialist Party. Former General Secretary Bob Crow publicly slammed Labour, which was then led by Tony Blair, for a failure to support members. The deadlock continued until the 2012 Durham Miners’ Gala, when the then Deputy Chairman of the Labour Party, Tom Watson, seemed to offer the RMT an olive branch. But Mr Pinkney said three months after Bob Crow died the union voted to sever ties with Labour permanently – and today rules out any future affiliation. “That is not going to happen,” he said. “It was a unanimous decision to disaffiliate with Labour and our members would never want to go back. “If Ed Miliband is [more supportive of unions] then he is doing a strange impression of it. He might say that he is to his paymasters at Unite and GMB, who make hefty donations, but our members will not affiliate to Labour or any other party ever again. Labour has named Redcar in its top 100 seats to win in May and has high hopes for candidate Anna Turley. Vera Baird lost the seat to Lib Dem Ian Swales in 2010 in what was the highest swing against Labour in the wake of the closure of the Teesside Steelworks. A poll by Lord Ashcroft in September put Labour on 44%, Lib Dems on 18%, Ukip on 23%, the Tories on 12% and the Greens on just 2%. A Labour Party spokesperson said: “The choice in front of Redcar people in May is between a Tory or a Labour government. “For all those passionate about the green agenda only Labour has the record and plans to deliver a green government. > Well, don’t they have a sense of entitlement ? Only us or them can be in power – its our right. Two sides of the same coin. The Saltburn-born rail union boss, who is calling for capitalism to be replaced, said he was inspired by the election of the left wing Syriza in Greece. He said: “We need to look after our elderly, build social housing, repeal anti-trade union laws, scrap bedroom tax, renationalise railways and utilities (and any profit reinvested), but most of all we should give the young hope. “We are definitely handing on worse conditions than we inherited. My generation should hang our heads in shame for letting this happen. Instead of complaining about young being on streets, and using drugs, we should be asking why. “Redcar and Cleveland has seen a massive decline in my lifetime. We need proper investment, and not just paper over cracks. I believe the Greens are only large party (as surely they can now claim to be) that wants to put things right. 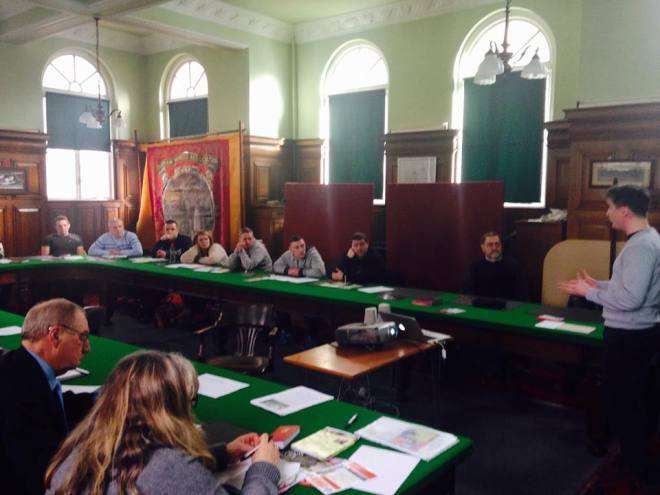 Yesterday saw a one day event at Durham that looked at the history and the future of The Durham Miners Gala and the unique characteristics of mining communities. Unite Community members from Durham and Newcastle attended and we were joined by a group of people from Recovery Durham . The course was lead by Dave Wray and John Stirling – who are both passionate about the subject matter. We started with a fascinating talk from Dave about the history of the Mining banners which, in some cases, came to symbolise the community it was attached to. 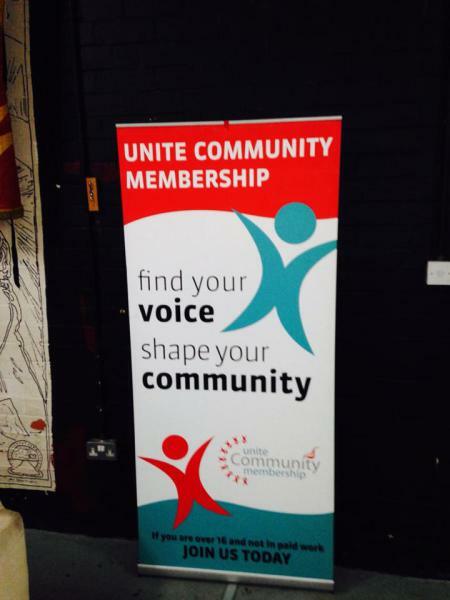 Launched in 2011, Unite Community membership, gives anyone who is not in work a chance to join Britain’s biggest union and combine with their working colleagues in campaigning for an improved standard of living for all. In 2014, Unite NEY&H (North East, Yorkshire & Humberside) Community membership, costing just 50 pence a week, increased significantly to reach 1000. A range of ongoing events throughout the year has encouraged more people to join and get politically active. Meanwhile, the community advice centres in Durham and Barnsley both continue to provide invaluable welfare support to local people. A third centre is due to open in Farsley at the start of 2015. Joe Rollin is the Unite community co-ordinator for NEY&H. John Stirling a trade union educator who has written about the future of unions. The day will be an interactive one with plenty of opportunity to share experiences and opinions alongside the presentations. 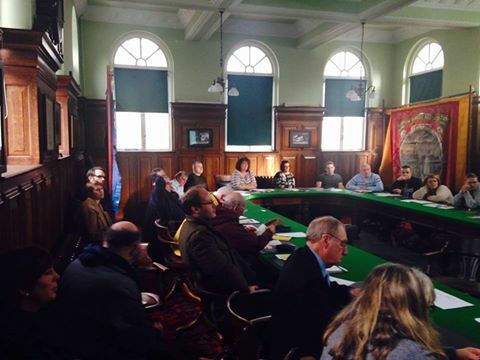 The event will be held at the Durham Miners Association Red Hills, Durham. At the moment definite times have yet to be confirmed but it is envisaged that it will run from 10.30 am to 4.00pm. A long-running campaign to erect a memorial to miners killed in a village’s pits has finally ended in success. A pit wheel mining memorial has been unveiled on Coxhoe’s village green, eight years after members of Coxhoe Banner Group set out on the project. Chairman Robert Robinson said: “I was in tears. There were a lot of tears shed that day. “We’ve had so many knock-backs in those eight years. But we weren’t going to give up – we were going to keep fighting. The Banner Group was founded 12 years ago and its first task was to have a new miners’ banner created for the village. Once that had been achieved, members turned to the memorial. They bought a genuine pit wheel from Coal UK in Doncaster but encountered problems finding a site, buying the plot and securing funding, so the wheel remained in storage for several years. After several different groups started to work together, progress speeded up around two years ago, leading to the memorial being unveiled on the morning of this year’s Durham Miners’ Gala, Saturday, July 12. North Skelton Band performed, Rev Christopher Wood-Archer led a service and the wheel was unveiled by Jenny Robinson, Banner Group secretary, and county councillor Maria Plews. The overall cost of the project was about £70,000. The wheel stands on limestone flagstones and against a limestone wall, honouring the village’s quarries, and includes sleepers, representing the village’s railway heritage. In future, the names of men and boys who died in Coxhoe’s three pits, West Hetton, Joint Stocks and Clay Hole, and one drift mine could be added to the memorial and flowers and interpretation boards added nearby. Mr Robinson also hopes to restore a historic wall which was removed.